As it turns out, contracts between between Vigilant and Guadalupe County, the City of Orange, and the City of Kyle in Texas reveal that Henson was right to worry. The “warrant redemption” program works like this. The agency is given no-cost license plate readers as well as free access to LEARN-NVLS, the ALPR data system Vigilant says contains more than 2.8-billion plate scans and is growing by more than 70-million scans a month. This also includes a wide variety of analytical and predictive software tools. Also, the agency is merely licensing the technology; Vigilant can take it back at any time. The government agency in turn gives Vigilant access to information about all its outstanding court fees, which the company then turns into a hot list to feed into the free ALPR systems. As police cars patrol the city, they ping on license plates associated with the fees. The officer then pulls the driver over and offers them a devil’s bargain: get arrested, or pay the original fine with an extra 25% processing fee tacked on, all of which goes to Vigilant.1 In other words, the driver is paying Vigilant to provide the local police with the technology used to identify and then detain the driver. If the ALPR pings on a parked car, the officer can get out and leave a note to visit Vigilant’s payment website. Update: Buzzfeed has published an in-depth report on how police in Port Arthur, Texas also use Vigilant Solutions ALPR technology to collect fines. Update January 28, 2016: We have updated this piece to include the City of Orange's contract with Vigilant Solutions. Clarification January 28, 2016: We originally stated that data collected under this program may be sold "potentially to private companies such as insurance firms and repossession agencies." Vigilant generally agrees in its contracts and policies that ALPR data collected by law enforcement agencies will only be shared with (i.e. sold to) other law enforcement agencies. However, data collected by Vigilant directly may be shared for a variety of purposes, including insurance and repossession. We used the word "potentially" because it gets murky when it comes to ALPR systems licensed to law enforcement that are not the property of the agency, but rather are Vigilant's property attached to a police vehicle. 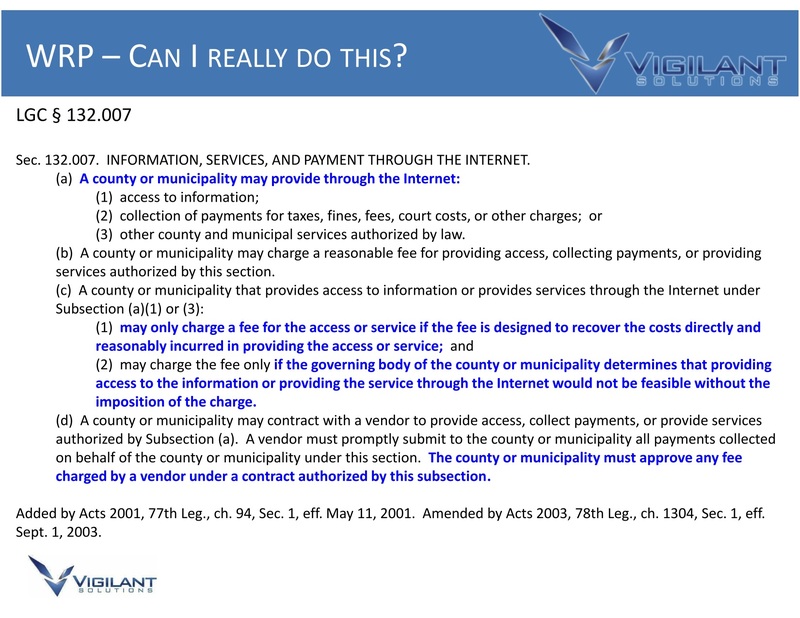 Vigilant's contract with the City of Kyle, for example, allows Vigilant to use the data "in accordance with, and pursuant to, a permissible purpose set forth under the federal Drivers Privacy Protection Act (DPPA)." The DPPA includes many permissible purposes, such as insurance purposes and or private investigations, but it also usually only regulates vehicle registration data, the information that would allow you to connect a name or addresses to license plates. Vigilant itself notes in its materials that DPPA regulates connecting personal information to a license plate, but argues LPR data on its own is fair game because "there is no reasonable expectation of privacy." It's also unclear how Vigilant treats data collected by Vigilant employees and contractors on behalf of law enforcement agencies, as is the case in Guadalupe County. Vigilant's policies also allow the company to retroactively change its usage rules at anytime. 1. The contracts are inconsistent on how this fee breaks down. For example, the City of Kyle contract lists 5% of "credit card processing," 5% for "credit card handling," and 15% for a "vendor transaction fee."